The Walking Dead: After a montage of character close-ups that mimic the montage that kicked off this whole season, Negan comes to Dwight’s room. We get a bit of eye candy as the camera lingers on this double agent, shirtless, contemplating the wedding ring he keeps tucked inside a cigarette pack. That was the highlight of the episode, alas. Grade: C+. 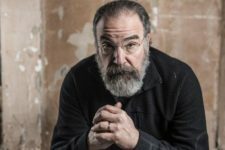 Homeland (pictured): I’d never thought I’d say this, but this season could use a lot more Mandy Patinkin. Out of everyone, Saul’s the only one making level-headed, rational, believable choices. Homeland‘s always required some suspension of disbelief, but this episode pushed it to the extreme. Grade: B. The Good Fight: Sometimes everything the show tries to do might not work, but it’s never boring. Case in point, the two major plots in this week’s episode: a scare at the law firm and a topical case about sexual assault on a reality show. Grade: B+.